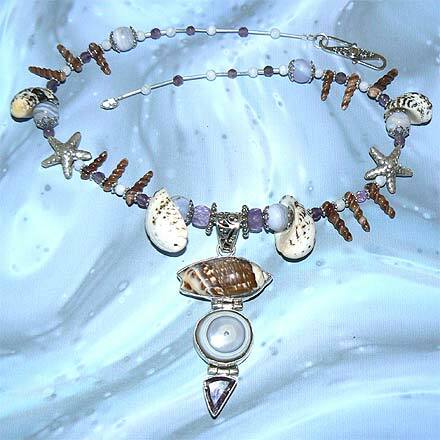 Sterling Silver Blue Lace Agate, Seashells and Amethyst Necklace. See Closeup. 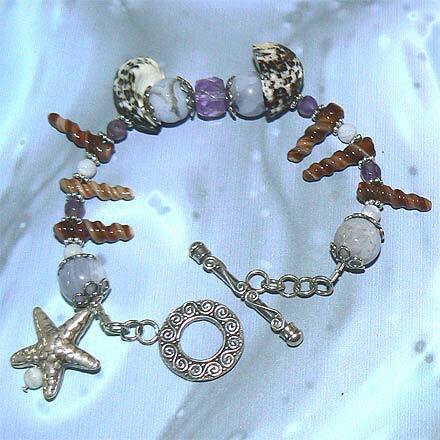 Sterling Silver Blue Lace Agate, Seashells and Amethyst Bracelet. 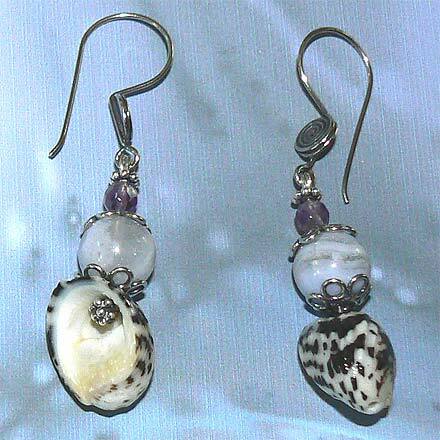 Sterling Silver Blue Lace Agate, Seashells and Amethyst Earrings. Gems from the sea, little treasures you'd find on the beach. It reminds me of when Stan and I went to an island in New England in November...the sky was the color of Blue Lace Agate, and despite the chill, we found a myriad of ocean-washed pebbles and seashells and live starfish (which we gave back to the sea). The silver stafish beads used here are made in Thailand which uses a higher silver content than the usual .925 Sterling that they use with Balinese beads. 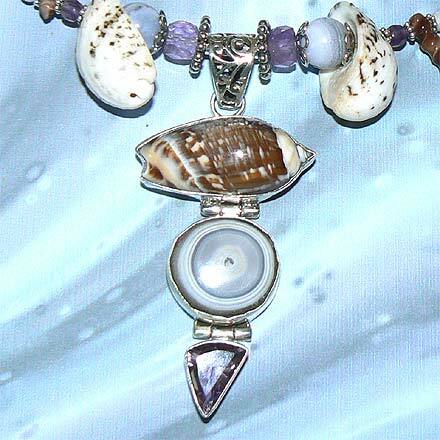 Sorry, I can't tell you the species of seashells in this jewelry, but the neutral colors go so well with the muted blues and purples of the Agate and Amethyst. The necklace is 19¼" with a 2.8" pendant (with an amzing circular Blue Lace Agare piece! ), and the matching bracelet is 7¾". For those who are interested in Astrological significances of stones, Agate corresponds with Capricorn and Gemini and Amethyst corresponds with Pisces and the month of February.